Sushi is one of my favorite foods, but I don’t eat it often because it’s quite spendy. Fortunately, I’ve found other ways to get my sushi fix without spending $10.00 to $15.00 per roll at a restaurant: I either make it myself at home, or take the easy route and put all of my sushi ingredients in a bowl. This recipe couldn’t be easier to make. Customize your bowl: Try adding imitation crab, smoked salmon or another type of fish. Add different vegetables, such as sugar snap peas, radish or roasted Japanese sweet potato. Top with pickled ginger, scallions, seaweed and yum yum sauce. The sky is the limit! Whole30 and Paleo variation: Omit the rice. Add more veggies and protein. Serve on top of a bed of spinach or romaine. These bowls are customizable. See above for variations. Save money by using what you already have! Prepare rice according to package directions. Remove from heat and place rice in a large bowl to cool. Sprinkle on about two tablespoons of sushi vinegar. Sushi bowls can be served with warm or cold rice. Mix tuna, mayonnaise, and sriracha sauce. Place 1 cup prepared rice in each bowl. 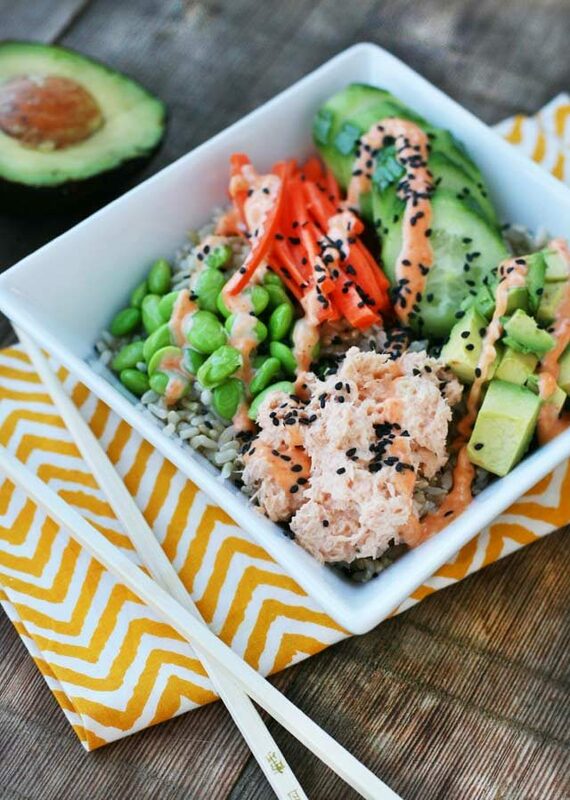 Top with tuna, edamame, carrots, avocado, and black sesame seeds. Combine ingredients for spicy mayonnaise and place some on top of each bowl.